You must have your Twitter user name entered in the "General Settings" tab of your themes options for this to function properly. As the economy grows more global, the impact of financial crisis in any country has come to affect us all. Corporations fail, the stock market and currency values fall, deposits are at risk, pension plans are lost, and, in some cases, even civil unrest follows. In short, these crises can no longer be ignored. 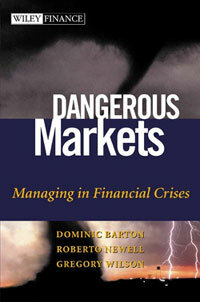 In their new book, DANGEROUS MARKETS: Managing in Financial Crises (Wiley Finance; October 2002; hardcover) Dominic Barton, Roberto Newell, and Gregory Wilson tell how to anticipate, manage, and prosper in financial crises around the globe. •	Build for the future, by setting new, market-oriented standards and safeguards to avoid subsequent crises and lessen their impact. The authors believe that financial crises are likely to become more frequent, more costly, and longer-lasting in the future. The reasons are wide ranging – from continuing value destruction in the real economy, to poorly supervised banking systems, to inadequate capital markets, and inefficient linkages to the global system. In particular, the authors examine the current weaknesses in Japan, China, India, and elsewhere that could soon have major geopolitical and economic consequences. 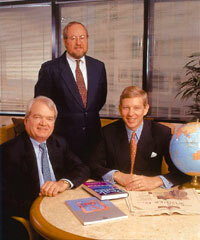 John Thornton, Financial Times, December 30, 2002. “Worried about a financial crisis in your country? Why not host a dinner party? That is one of the few whacky suggestions in a decidedly unwhacky new book by three employees of global consultants, McKinsey & Co. Their book concludes that financial crises like the one that swept Asia in 1997 and 1998 have become more frequent in the past decade or so and will become more frequent still as developing countries enter the global economy.